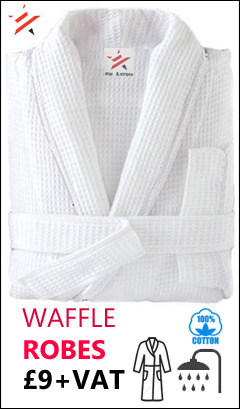 At BathrobesUK.co.uk our core objectives are to offer our customers the best possible choice in bathrobes and towels and to offer a professional and quality embroidery service. We are a large import, export and wholesale business based in London and work with our customer based in the UK and Europe. We offer a huge choice in stock, colour and sizes in bathrobes and towels to cater for our ever rowing portfolio of hotel and spa customers. Our experience in the business for the last 30 years has given that trust which our customers require to ensure regular availability of bathrobe stock all year round.